The Marshall High School virtual sign, a first for MISD, is up and running thanks to a generous donation from local community members. 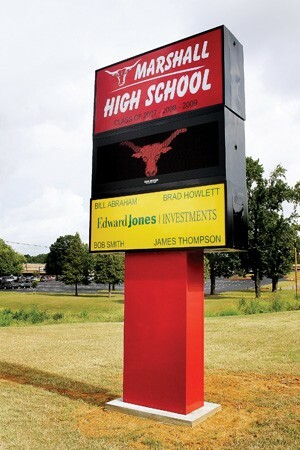 The sign, in front of the high school, was donated by four financial advisors for Edwards Jones and Company in Marshall; Bill Abraham, Brad Howlett, James Thompson, and Bob Smith. The donors said about a year ago they were approached by the MISD school administration and asked if they wanted to donate a sign to the school system. All four working at separate offices, decided to come together and split the cost equally. "The four of us got together and said that it sounds like a wonderful project for the school and the community," said Bob Smith. "The sign and everything is owned by the school, we just had to put up the money." The almost $28,000 sign is said to provide virtual communication about after-hour school events, athlete of the week, and even school emergencies. "They (the administration) were interested in having something like this, obviously communication has benefits," said Smith. "On a daily basis, they have the ability to communicate with the student body, parents and the community." The sign took a little over a year to become established because the placement location rested on state property. "A lot of it had to do with the land and figuring out where we could put the sign, and getting clearance from the state was the big hold up," said Smith. The class of ‘07, '08, and ‘09 raised the money to put up the sign and run its electricity. These classes, along with the four donors, are recognized on the sign. "This is one way we could get the power to the sign and make it work. Those three classes saved money for three years," said Bill Abraham. Now that it is finally in place, the donors said they were excited to see the daily outcome of communication from the school to the parents and students. "We are glad that we are here to help. 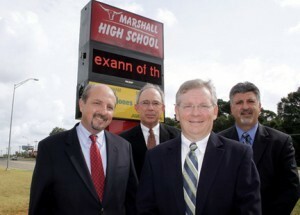 Marshall has been good to all of us and we are happy to give something back," said Abraham.